Big Banks Pay $5.6 Billion, Plead Guilty To Felonies Over Currency And Rate-Fixing : The Two-Way In one exchange, a broker told a trader, "mate yur getting bloody good at this libor game ... think of me when yur on yur yacht in monaco." Clockwise from top left: Barclays, Citicorp, JPMorgan Chase and the Royal Bank of Scotland will pay billions in fines and plead guilty to criminally manipulating global currency market going back to 2007. The bank UBS AG (not pictured) has also agreed to plead guilty. 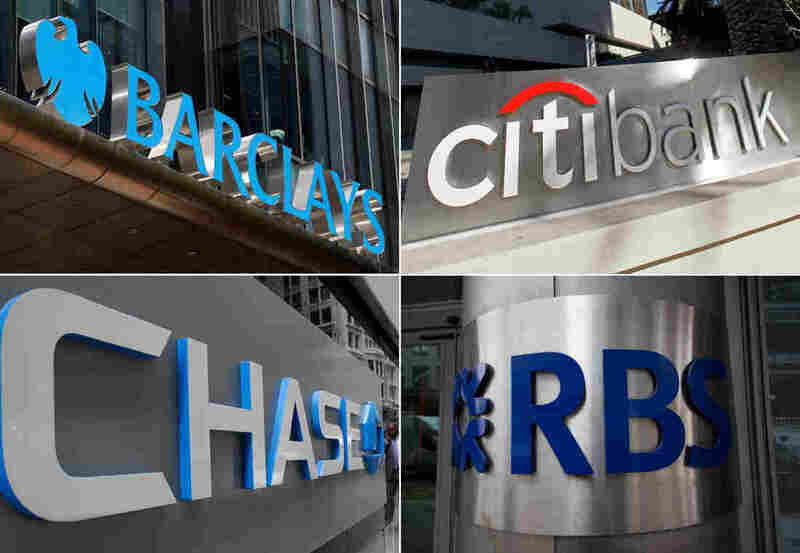 Citicorp, JPMorgan Chase, Barclays, The Royal Bank of Scotland and UBS AG have agreed to plead guilty to felony charges and pay billions in criminal fines, the Department of Justice says. The offenses range from manipulating the market price of U.S. dollars and euros to rigging interest rates. Citicorp, JPMorgan Chase, Barclays, The Royal Bank of Scotland will pay fines totaling $2.5 billion to the Justice Department. In addition, the Federal Reserve is imposing fines of more than $1.6 billion on the five banks. In separate arrangements, Barclays will pay other U.S. and British agencies an additional $1.3 billion, and UBS will plead guilty to manipulating the London Interbank Offered Rate (LIBOR) and other benchmark interest rates, after the Justice Department found the bank's actions had breached a December 2012 non-prosecution agreement. The Federal Reserve says Bank of America, which isn't part of the Justice settlement, "failed to detect and address conduct by traders who discussed the possibility of entering into similar agreements to manipulate prices." The schemes that were unraveled were in play since December of 2007; in some cases, they continued until January of 2013, the Justice Department says. The banks will also spend three years on corporate probation. The Department of Justice says that conversations about fixing markets took place on a "near daily" basis, often in "an exclusive electronic chat room" that participants called "The Cartel" or "The Mafia." Transcripts included in the plea deals shows forthright discussions of fixing rates, with brokers, traders and others coordinating rates for a range of contracts and positions. "Broker-B: rite ok mate ill make a special effort"
In this context, 1m refers to one month, and so on. The plea document adds, "Later in the same chat, Broker-B remarked to Trader-1: mate yur getting bloody good at this libor game ... think of me when yur on yur yacht in monaco wont yu." After Trader-1 left UBS in the autumn of 2009, the document says, their replacement "felt pressured to continue" manipulating the market, after having a discussion with the bank's manager of the Yen trading desk. The Justice Department says, "The majority of UBS Yen LIBOR and Euroyen TIBOR submitters, Yen derivatives traders, and their supervisors — as well as the more senior managers at UBS who were aware of this conduct — knew that the manipulation of Yen LIBOR and TIBOR submissions was inappropriate, yet continued to encourage, allow, or participate in this conduct." "The banks also misled their clients about the price of currencies, the federal and state authorities said, imposing 'hard mark-ups,' which one Barclays employee described as the 'worst price I can put on this where the customers decision to trade with me or give me future business doesn't change.' Or, to put their mission in the starkest of terms, the employee said: 'If you ain't cheating, you ain't trying.' "
Attorney General Loretta Lynch says the punishments show her department's willingness "to vigorously prosecute all those who tilt the economic system in their favor; who subvert our marketplaces; and who enrich themselves at the expense of American consumers." "The penalty these banks will now pay is fitting considering the long-running and egregious nature of their anticompetitive conduct. It is commensurate with the pervasive harm done. And it should deter competitors in the future from chasing profits without regard to fairness, to the law, or to the public welfare."